SPECIAL: 15% discount during 14 January – 31 March 2019. Please ask. This ride is suitable for all levels of riders. Non riders can also join. Rates are quoted per person sharing based on 2 or more people booking. Discounts also available for children under 15 years of age travelling with at least one adult – please enquire. 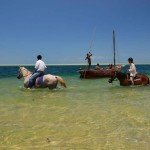 All riding, meals, all local drinks (soft drinks, spirits, beers and house wines), transfers, airport pick up and drop off, motorised dhow trip to Benguerra Island, laundry, massage/yoga sessions, national park fees and Mozambique Government VAT. In the hotel room, a complementary fruit bowl and gift pack are provided, as well as the fridge being stocked with water and cool drinks. Flights, personal travel insurance, visas, any personal spending money and any extra excursions or activities not included in the itinerary. An international flight to Johannesburg. Followed by an internal African flight to Vilanculos. Your hosts will meet you at the airport and transfer you to your accommodations, a short drive. 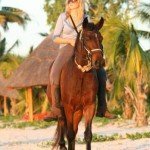 If you have read the wonderful story ‘One Hundred & Four Horses’ by Mandy Retzlaff about the incredible journey her family and their horses take from war torn Zimbabwe to a new life in Mozambique, you might be thrilled to know you can visit their home as a guest and ride one of their very lucky horses. 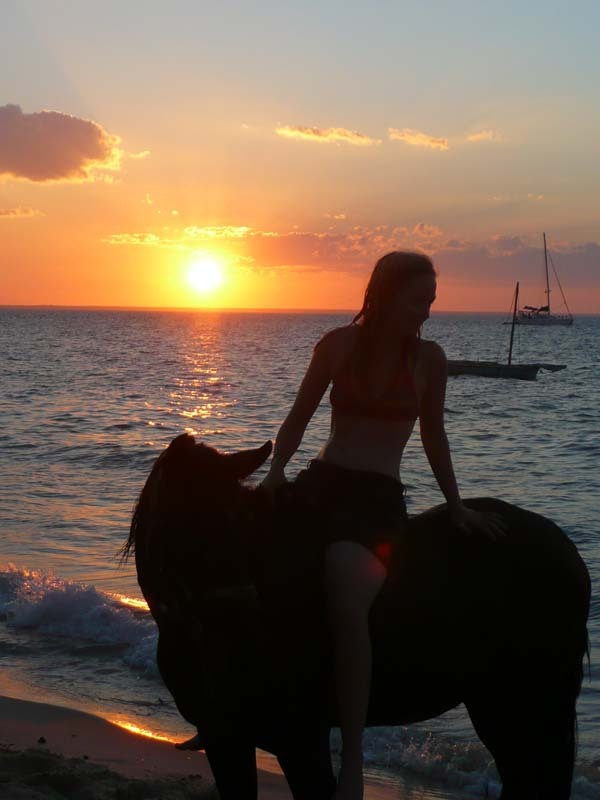 The Reztlaff Safari is the ultimate beach riding adventure where each day you will ride over different areas of coastline and experience the joys of cantering along the beach, riding up and down huge sand dunes and swimming with your horse in crystal clear waters after a long, hot day in the saddle. 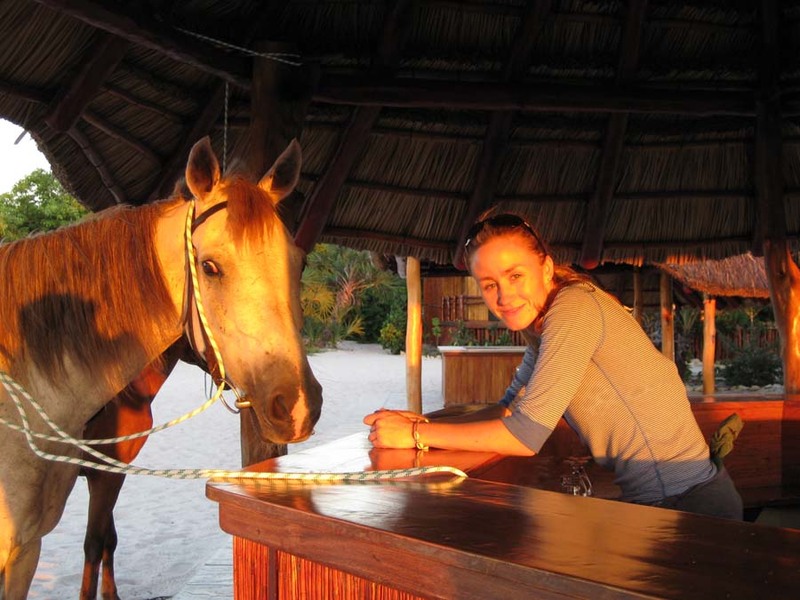 On a Retzlaff Safari you’ll also have the pleasure of riding and socialising with the remarkable Retzlaff family, they like nothing more than to share the pleasure of their new home and recount the stories of the journey that took them to this exact spot. As the land invasions gather pace, the Retzlaffs begin an epic journey across Zimbabwe, facing eviction after eviction, trying to save the group of animals with whom they feel a deep and enduring bond – the horses. 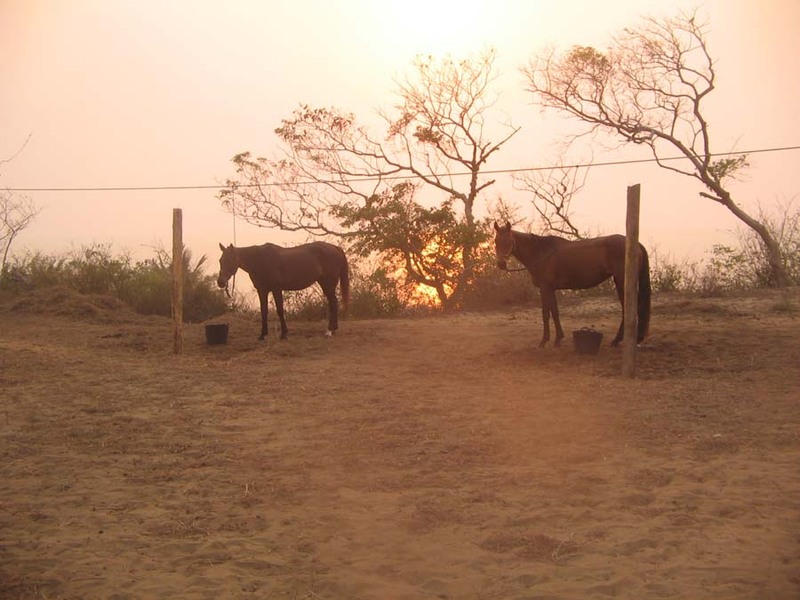 Each with a different personality and story, it is not just the family who rescue the horses, but the horses who rescue the family. 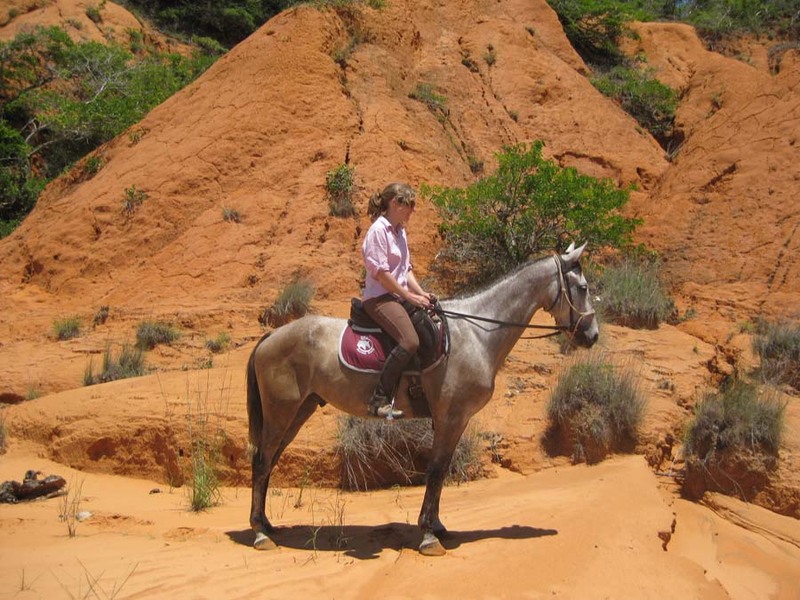 Grey, the silver gelding: the leader. Brutus, the untamed colt. Princess, the temperamental mare. The stunning town of Vilankulo is world renowned for its variety of white sand beaches, alluring golden sunsets and tall palm trees. 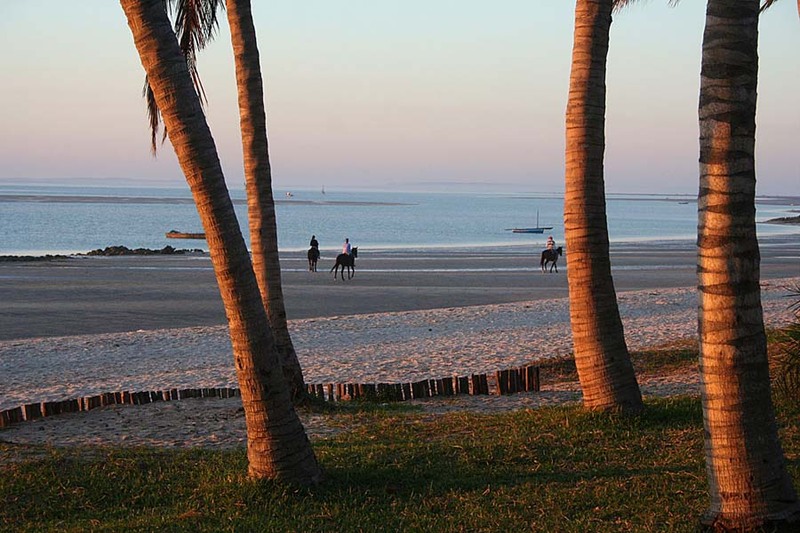 The beaches stretch for tens of kilometres allowing riders plenty of opportunities for exhilarating canters and long trots. 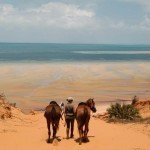 There are extraordinary views over the Bazaruto Archipelago, red sand dunes to explore and a fascinating fishing village where the local chief will welcome you in the traditional style. Vilankulo also has many interesting markets and there remains a visible Portuguese influence in the restaurants and culture, a result of its past inclusion in the Portuguese Empire. 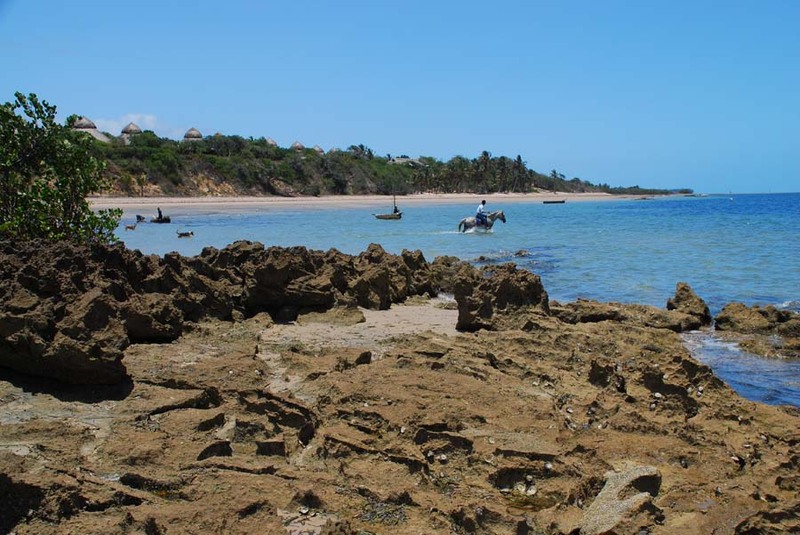 As well as all this, visitors have the opportunity to travel to Benguerra Island which was declared a National Park in 1971. 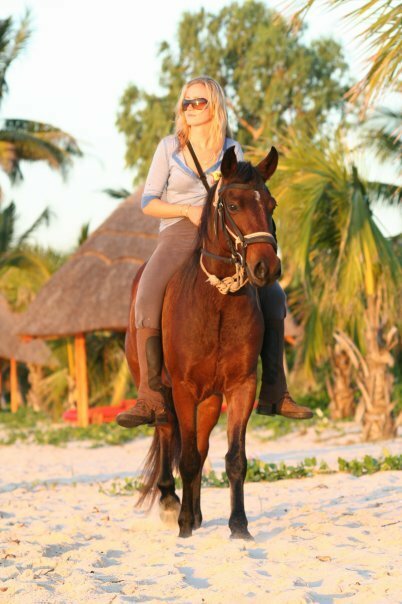 Guests can ride on different horses also owned by the hosts, travelling through forests and savannahs, around freshwater lakes and past wetland eco-systems. The island is home to around 140 species of bird and fresh water crocodiles and flamingos can be found in the three lakes. The island is also known for its remarkable dive sites. 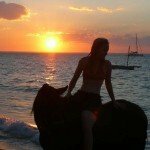 After a wonderful day’s riding there is nothing better than returning somewhere lovely to relax, to enjoy an exotic cocktail and to eat a delicious meal before watching the sunset from the beach. Accommodation for these holidays is in a lodge located on the beach and it features eighteen chalets and an excellent restaurant and bar. 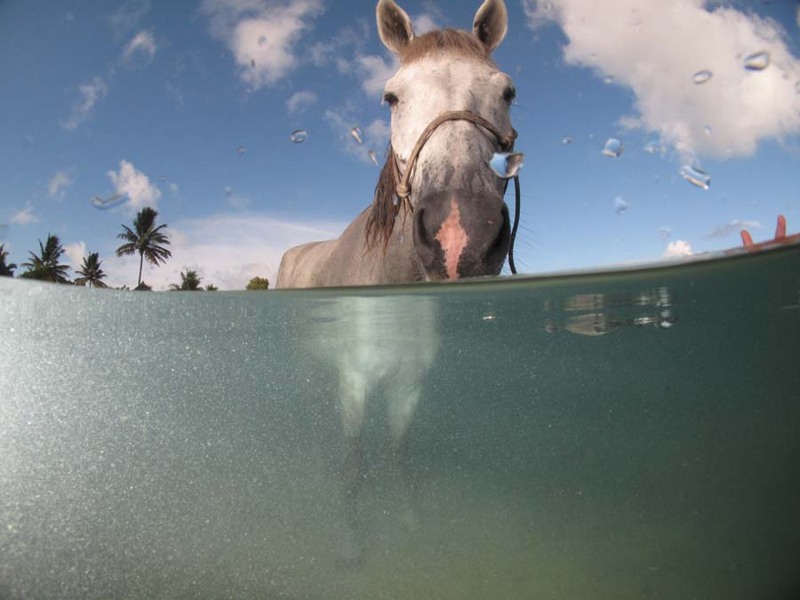 This is the finishing touch to these breathtaking holidays, a little slice of paradise for the horse loving traveller. 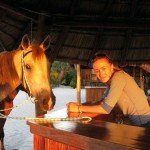 And lets just say you’re there on your honeymoon, and the riding isn’t exactly your other halves cup of tea, well the lodge has plenty of other activities that both of you can enjoy – a fully equipped dive school, snorkelling, Dhow boat rides, big game fishing, salt water fly fishing and bird watching. 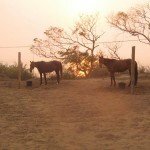 Horses – A mix of Thoroughbreds, Arabs & South African Boerperds. 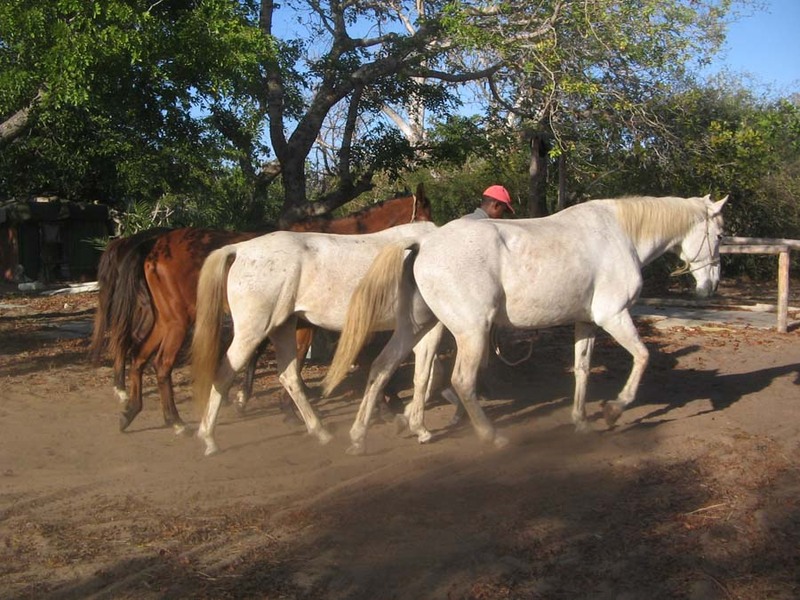 Very well cared for by the Retzlaff family, and schooled to a good level so that they give guests a good responsive ride on the Retzlaff Safari. 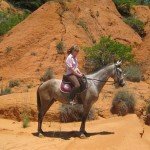 Tack – A combination of English, McLellan & Australian stock saddles, mostly snaffle bridles. 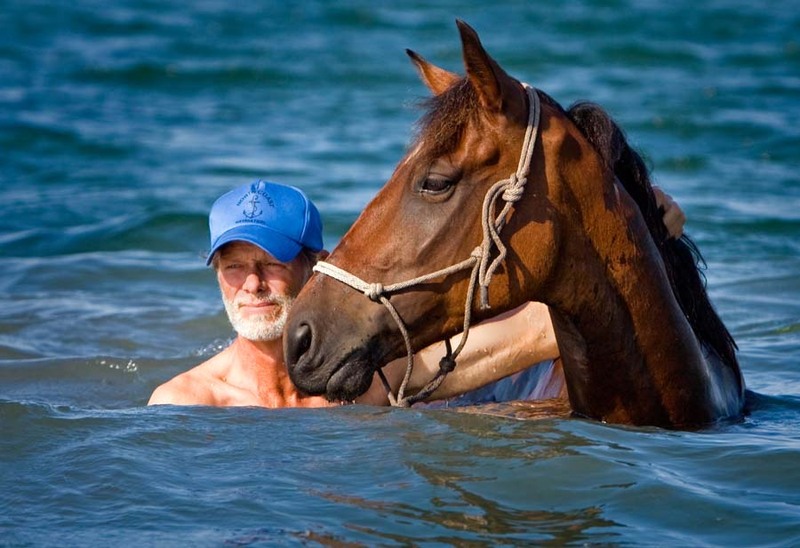 Horses are trained in both English & Western riding. Weight Restriction – 15 stone / 209 lbs / 95kg. Group Size – Maximum 6. 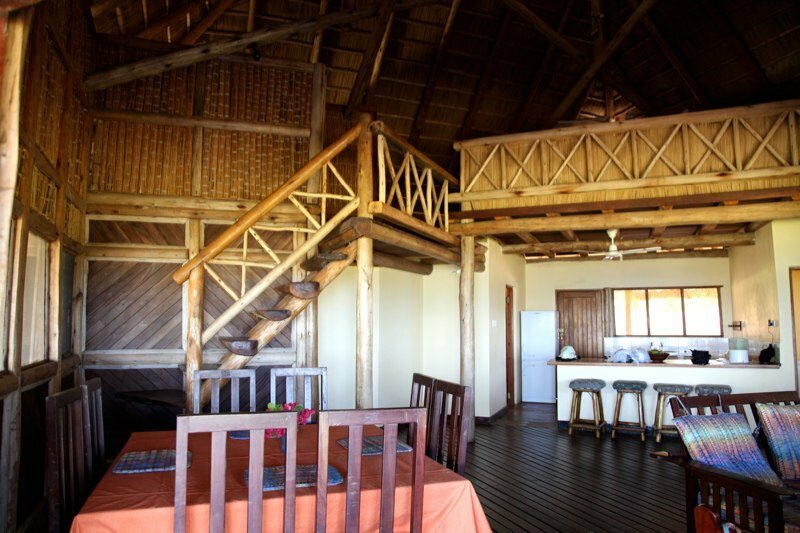 Accommodation is usually at Vila de Sonhos on the outskirts of Vilankulo. Vila de Sonhos has impressive rooms with en-suite bathrooms and wide open balconies overlooking the turquoise sea. There is private access to the beach through the gardens and a swimming pool. All guests have their own room within the villa and you are not expected to share with a stranger. 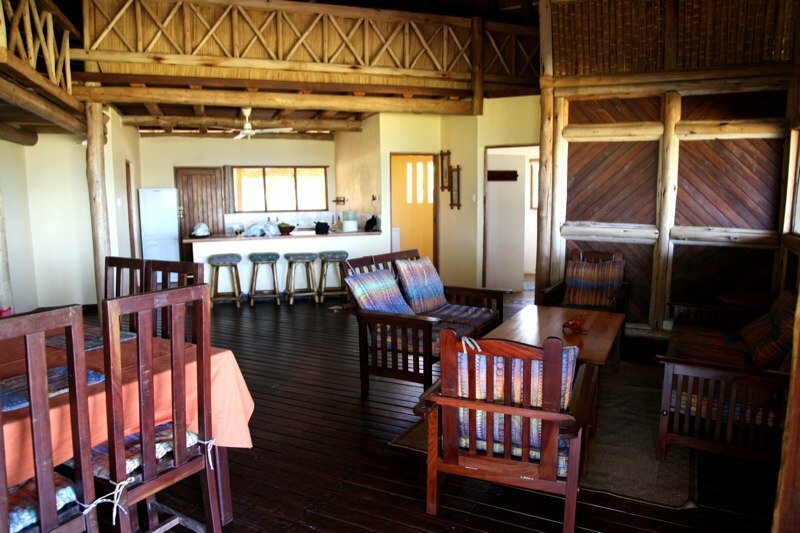 Each villa has it’s own chef so breakfast will be served on the verandah. It is within easy walking distance of the stables and just a short ride from the town centre. If this resort is full then you will be accommodated in similar resorts in the area. The lodge restaurant serves delicious food and there is also the chance for some real culinary treats during the rides – Peri-Peri chicken, Matapa (a traditional Mozambican dish made from cassava leaves, nuts and coconut milk), seafood lunches and a refreshing coconut drink. You will also be shown how to eat fresh crab and can of course enjoy the exotic cocktails from the bar in the evenings. 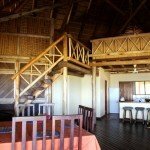 One of the best ‘barefoot’ luxury beach lodges in Africa, includes private ‘Casitas’ & ‘Cabanas’, and even a private villa, with it’s own pool and chef. All have their own verandahs that open out to the beach, and some also have their own plunge pools. It’s in the realm of “super special”. Just ask us for a quote. 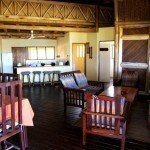 The food here is gorgeous, and guests can expect really fresh seafood, crab, crayfish and large prawns for dinner. Breakfasts & lunches are buffet style, with the emphasis on freshness. 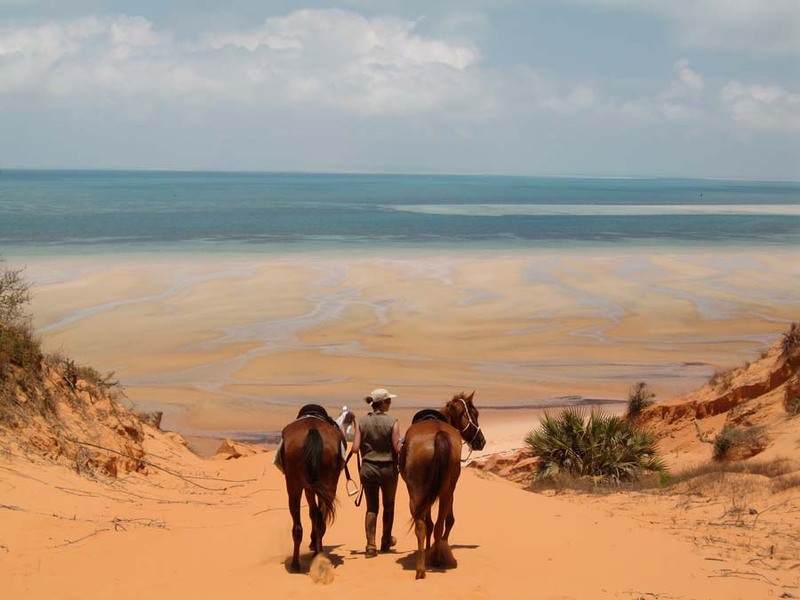 We sent International Showjumper ‘Cian O’Connor’ to Benguerra Lodge a few years ago and he described his horse riding holiday in Mozambique as ‘an idyllic getaway, with it’s white sands and turquoise waters’. 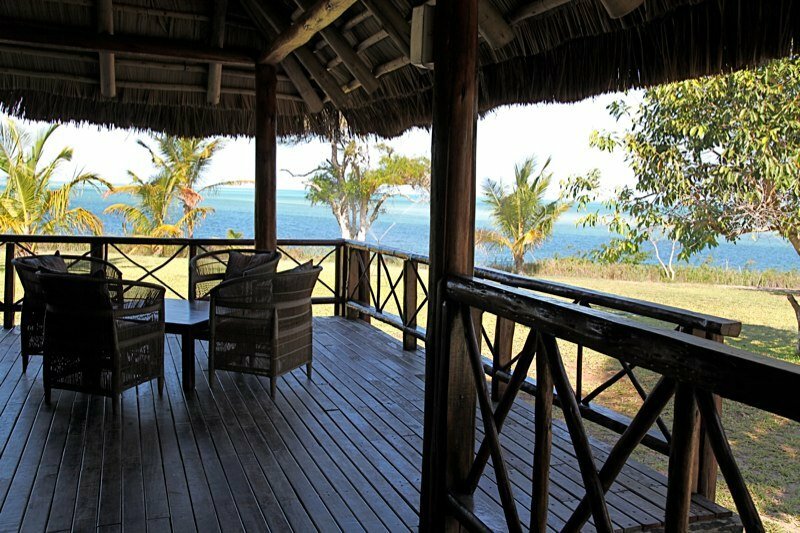 This is a truly relaxing and chilled out lodge, offering barefoot luxury on the small island of Benguerra, just off the coast of Mozambique. 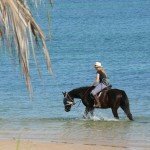 Enjoy long, lazy days chilling out at your private pool, or ride fit, well bred horses into the sea for a magical swim after a long, fast gallop across the beach. 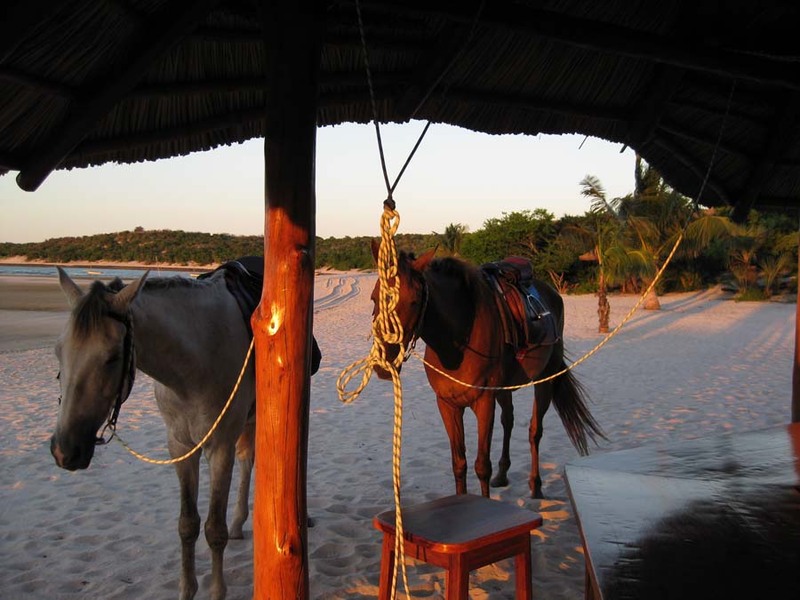 We think visiting Benguerra Lodge is either a great way to spend your honeymoon, or finish off an exciting riding safari holiday in Africa, with some chill out time on the beach. 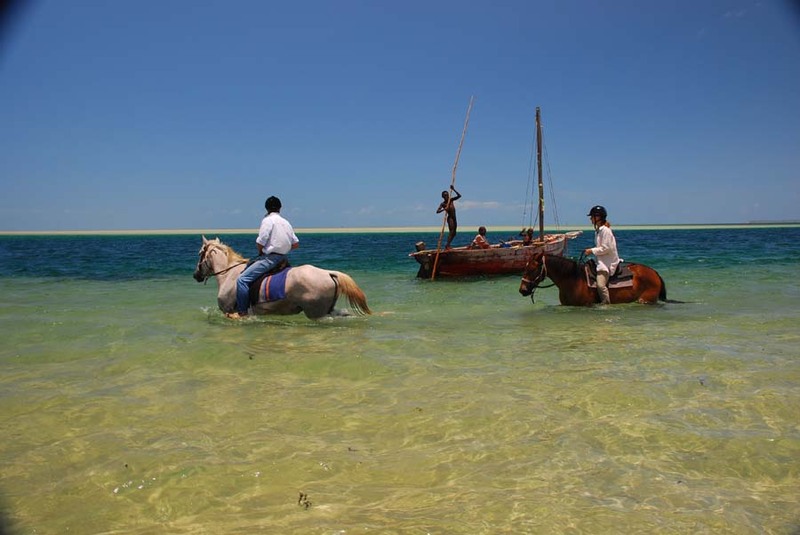 Horse Riding Holidays at the Retzlaff Safari are part of the Zara’s Planet Horse Riding Holidays Mozambique collection. 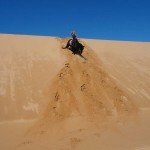 ‘Cian O’Connor’ also chose to visit Ants Collection on his holiday with Zara’s Planet – Ants is a luxury riding safari lodge in South Africa, and we think this is a fantastic combination riding holiday – safari & beach riding at it’s most luxurious. 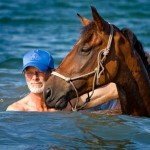 Riding safaris with big game in South Africa, Botswana, Kenya & Zambia – a perfect add on to his chilled out beach adventure. You will be met at Vilankulo Airport by Pat or Mandy, your hosts and guides for the week, and after a short transfer you will settle in to your accommodation at Archipelago Resort. 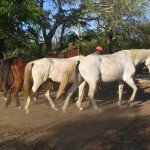 In the afternoon you will meet the horses and riding staff and will be presented with horses to try in the riding school. 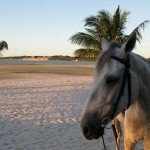 Once you have been matched to a suitable horse, you will enjoy an introductory beach ride giving you a chance to become familiar with the horses and tack. 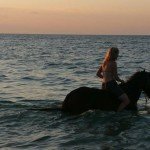 This is a slower, relaxing ride which incorporates the different eco-systems of the archipelago - wide open beaches, cliff top views, untouched dune bush and the mangrove shoreline. In the evening you will be served a fresh seafood dinner under the stars and overlooking the sea. The ride today is inland, following trails which wind between African villages and past the natural fresh water lakes. The birdlife here is wonderful and riders have a good chance of seeing eagles, herons, harriers, rollers, pelicans and kingfishers. You will canter along the bush paths, crossing farmlands and passing by the old ruins of Portuguese homesteads. 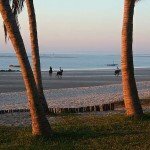 The riding route brings you onto the beach for the final stretch and you will ride by Chibuene, a key trading post dating back as far as the 7th century. This was used to connect the southern African interior and the Indian Ocean. The ancient dune is now covered in Baobab trees planted centuries ago for their vitamin rich fruit, creme of tartar. Tonight you can relax with a quiet drink by a bonfire and watch as the stars light up the African sky. Dinner will be a mouthwatering Mozambican BBQ. An early morning ride is scheduled for today and you will follow the beach northwards, passing through the outskirts of town into a wide open bay, home to a myriad of colourful dhows. The ride continues on through the bay and you will canter along the beach, observing as the local fishermen make their way home. 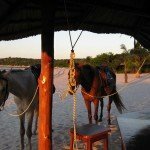 The morning ride ends with a delicious buffet breakfast at Casa Rex, Vilankulo's most exclusive resort. After breakfast you will meet a local guide to explore the bustling and vibrant city market - the colourful displays and clamour of noise gives guests an insight into the lives of the local community. Once your tour of the market is over then you will head back to your resort where you can siesta through the peak heat of the day or can simply relax by the pool. 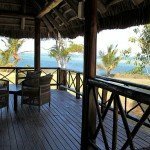 If you prefer then this day can be a free day to enjoy world renowned activities in Vilankulo such as scuba diving, snorkelling, dhow safari, whale watching, kayaking and deep sea fishing (activities at an additional cost). Lunch and dinner will be provided in the resort. 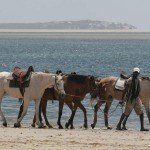 Today requires an early start - from town you will travel by motorised dhow across the Bazaruto National Park to Benguerra Island where a wonderful day awaits you. A packed breakfast is served on board whilst you admire the sea views and keep watch for dolphins, turtles and rays. 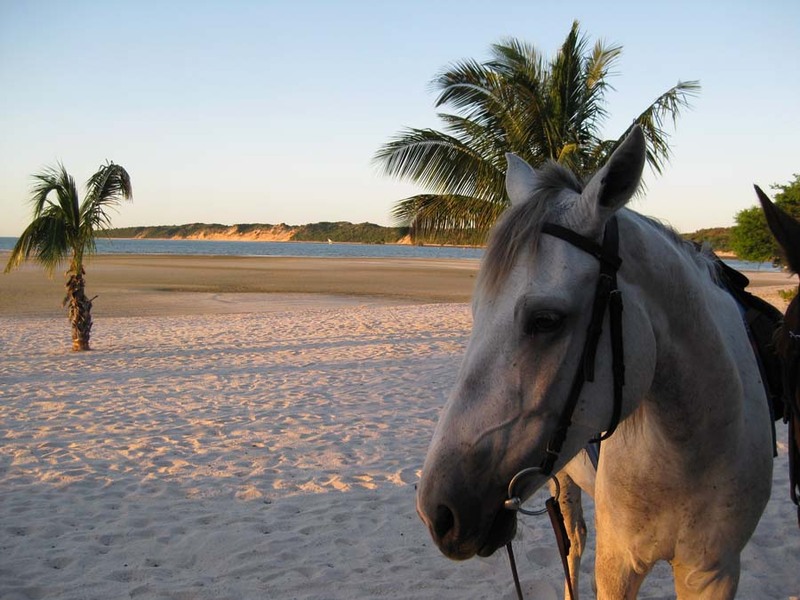 Benguerra Island is comprised of massive sand dunes, freshwater lakes and beautiful white sand beaches, all of which combine to create a breathtaking riding area. With a varied eco-system the island is home to an exceptional variety of birdlife and riders often see large flocks of flamingo. After the ride there is a mouth-watering seafood lunch prepared by the boat captain and then you will be guided by sail to Margaruque. Mask, fins and snorkel are provided and you are encouraged to take part in some of the world's finest drift snorkelling along a vertical rock drop off. For those not keen on the water you can simply relax and take a long walk on the impressive beach. The return to Vilankulo is a chance to admire sun set over the ocean before you return to land and eat dinner at a lovely restaurant. This unique day cannot be captured in pictures or by words, it is simply magical. This morning you can take your time, eating a relaxed breakfast and maybe enjoying a morning swim before the ride starts at 11.30am. This beautiful ride takes you through coconut plantations along the beach to Enrique's Fishing Village. Here you will be entertained by the local chief in true Mozambican style, sitting at the table to sample some traditional foods. You will start with a refreshing coconut drink and are then shown how to eat fresh crab and taste Matapa, a traditional dish made from cassava leaves, nuts and coconut milk. After this wonderful lunch you will continue your ride through the village and towards the 'Fingerprint of God', an incredible viewpoint overlooking the archipelago. 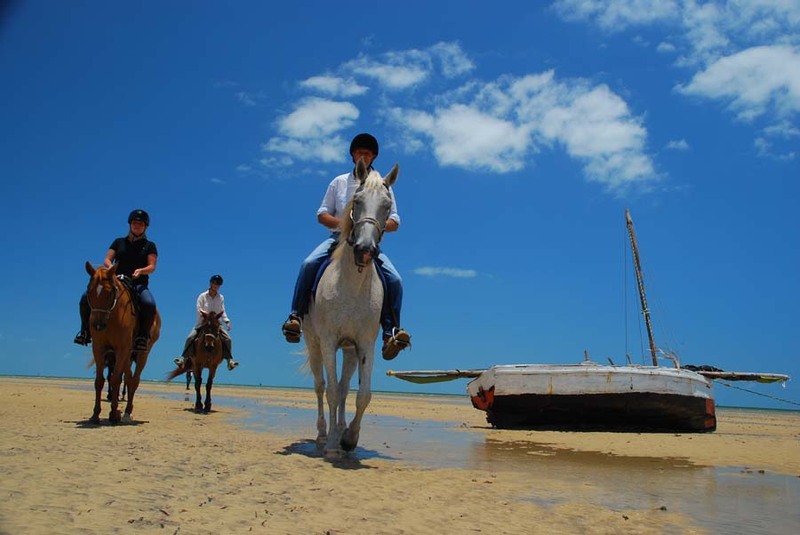 This day ride is a superb way to experience traditional African culture. In the evening you will be driven into town for dinner at one of the many restaurants. A hearty breakfast will be served at the restaurant before you saddle up for today's ride, a favourite with many guests. The route runs along the old coastal main road which runs parallel to the beach before heading up and wading across a small river estuary. During the route you will pass through small rural villages where children often come to wave at the horses. 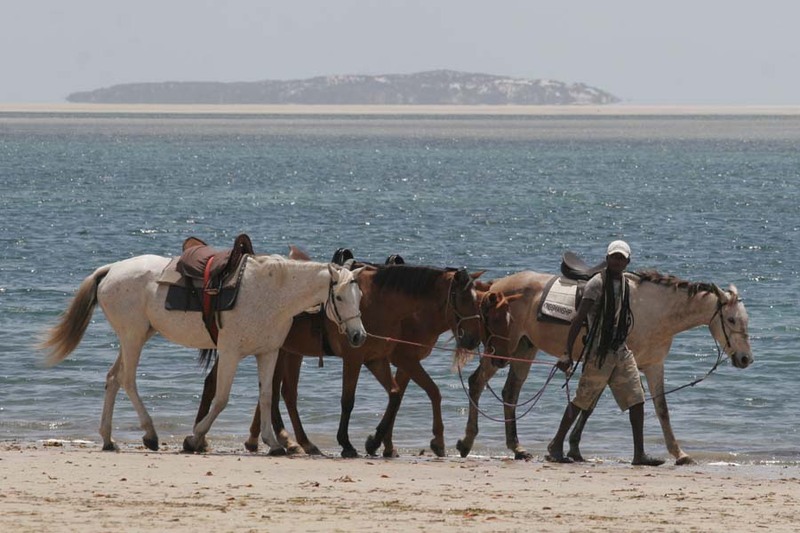 As the population thins out there are long, safe canters through the coastal bush. 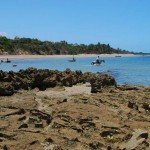 After several hours riding you will follow a bush track through the woodlands which heads down to the beach. 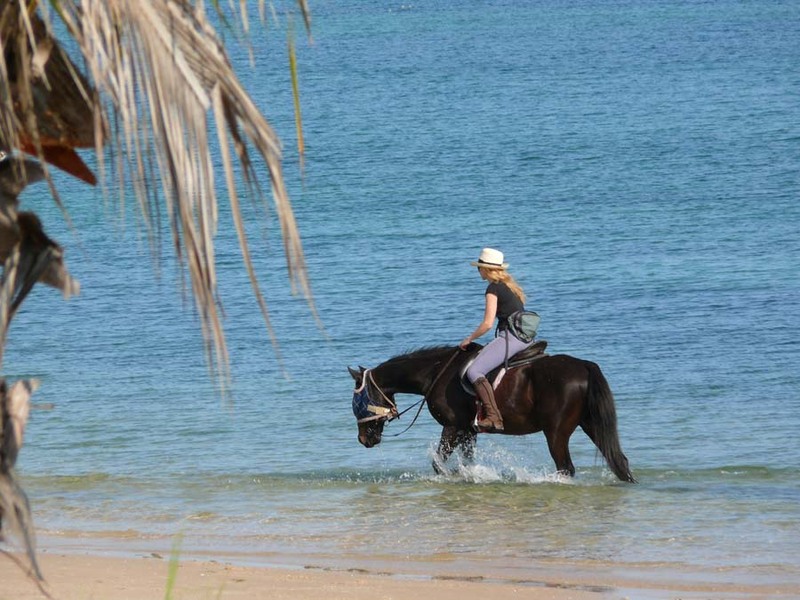 There are amazing views over the bay and the long, empty beaches offer the opportunity for dreamy canters along the coastline as you head back to the stables. After a long day in the saddle it's time for sundowners and a fine dinner at a local restaurant. 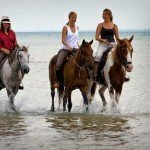 After a delicious breakfast you will be driven over to the stables and will mount up for an exhilarating ride through the outskirts of town and along the deserted beaches to the Red Dunes on North Beach. 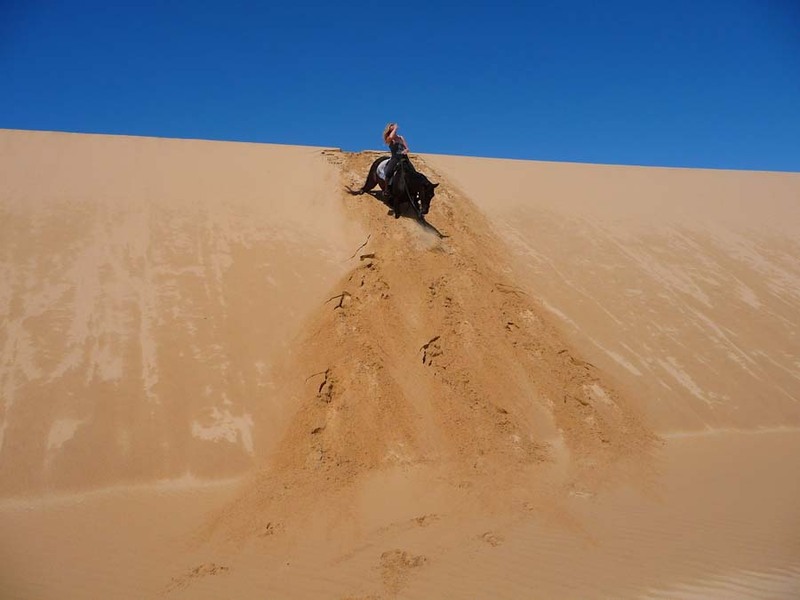 There are plenty of chances for controlled canters on the beaches before you climb the giant coastal dunes... the incredible panoramic views of the white sandbars and turquoise seas below are a special highlight of this holiday and not easily forgotten. Lunch is services at a beachside restaurant overflowing with seafood specialities. After lunch you will stop at a local arts and crafts centre which supports the local community - there is plenty of time to look around and pick up some souvenirs for friends and family back home. In the late afternoon you can relax by the pool or perhaps take a walk on the beach. Dinner tonight will be served in tranquil settings as the groups toasts to your last night. 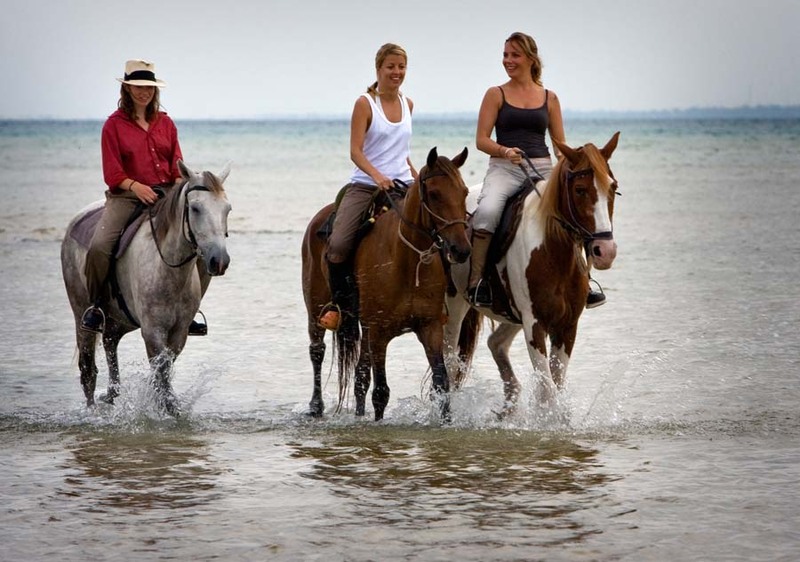 After a final relaxed breakfast you can take a short morning farewell ride up the coastline. The views over the bay and the long stretches of unspoilt beach will be a memory to last a lifetime. 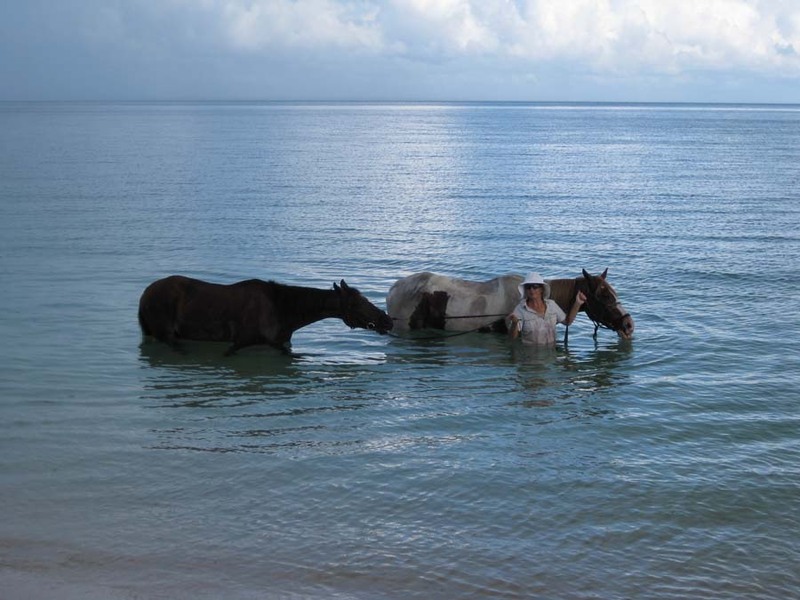 Your safari will be finished off with their world renowned swim - to see horses wallowing and rolling in the sea is a once in a lifetime opportunity and a magical experience. 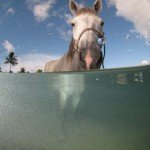 Riders are often completely mesmerised by the grace, power and movement of the animals in the water - don't forget your camera! Time for one final lunch before bidding farewell to new friends and preparing for departure. If the tide is due to be out on your final morning then the swim will take place on another day. NB. Please note this itinerary may change depending on the tides and weather conditions in the Bazaruto Archipelago. The ride order might be changed. Guests have the choice to ride as much or as little as they like. 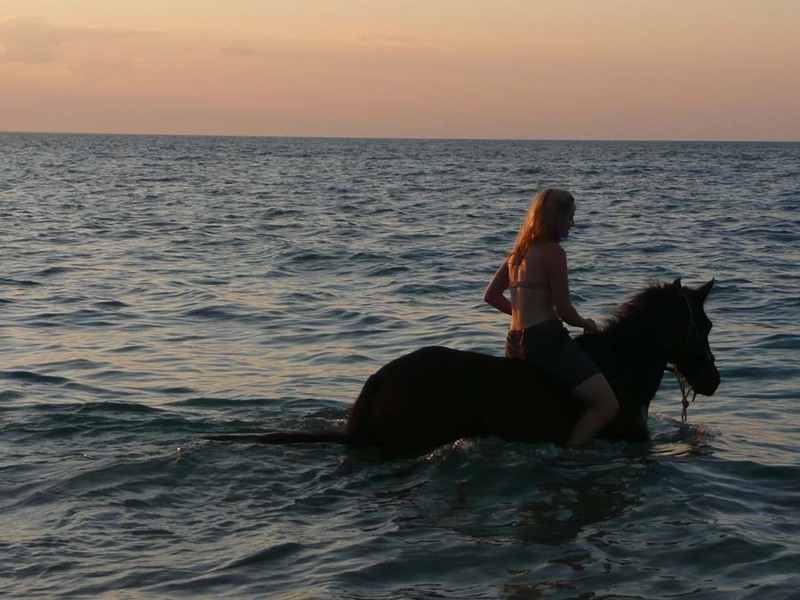 Guests are able to ride out anywhere across the island, which comprises of deserted beaches, woodlands, savannahs, and fresh water lakes. The food is typically African and involves a lot of fresh meat, fish and vegetables. 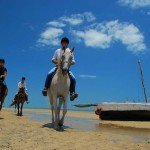 I have been lucky enough to have been on many riding holidays around the world but none quite as memorable as staying with Retzlaff Horse Safaris. I don't often say this as there are so many new places to visit but I will return. 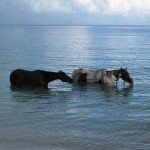 Benguerra Lodge is true barefoot luxury, an idyllic getaway with its white sands and turquoise waters, where we were able to chill out and relax, dive, swim with the horses - just perfect!